Summer boating is right around the corner, and so is the deadline for renewing boat and watercraft registration decals. 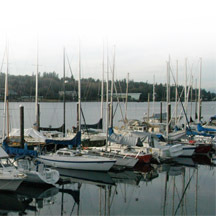 In Washington state, all boat registrations expire on June 30. Owners of boats and watercraft received a postcard in April informing them DOL won’t mail paper renewal reminders for boats and other watercraft anymore because the funding used to print and mail them was eliminated. The postcard invited these owners to sign up online at dol.wa.gov to receive renewal reminders by email. DOL will send out boat and watercraft email renewal reminders to those who signed up for them on June 9. To receive one of these reminders, boat owners have to sign up at the DOL website no later than June 8. Owners who sign up after this date will not receive a renewal reminder for their boat until next year. Boat registrations can be renewed online and in person at a neighborhood vehicle licensing office. Those who choose to renew in an office should make sure to note the registration number on the bow of the boat or watercraft and take that information to the office. A 22-year-old man was killed last week in King County after speeding, reckless driving and doing wheelies on his motorcycle. The man was ejected from his bike and died instantly after hitting a tree. 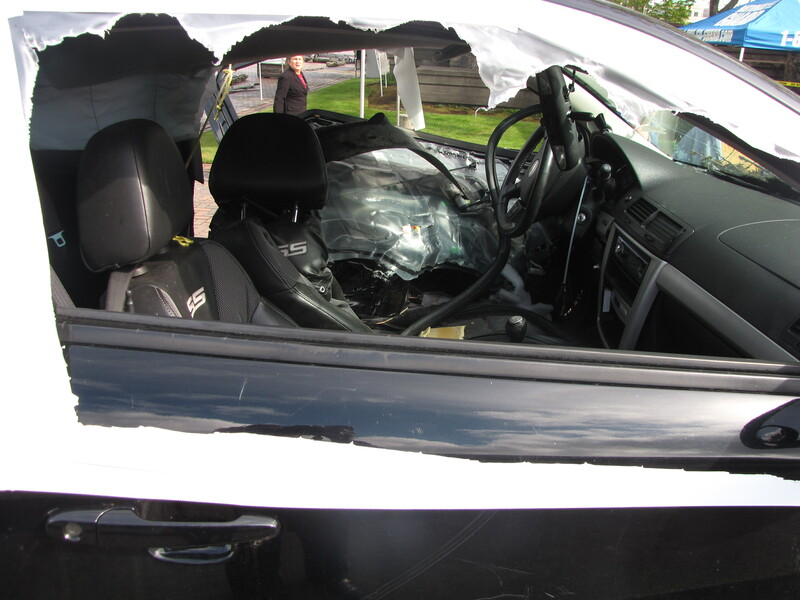 That collision underscores why May is motorcycle safety awareness month. Last year, 62 motorcycle riders lost their lives on Washington roads, and DOL is working with other traffic safety agencies to reduce that number to zero by 2030. DOL unveiled a motorcycle safety awareness campaign last week using transit ads, billboards and postcards to communicate with millions of drivers and about 27,000 unendorsed motorcycle owners. Riders can be difficult to see on busy roads because of their smaller size and profile. Motorists should take an extra second to be aware of what’s around them. An extra look could save a life. Motorcyclists have their own responsibilities – they share the same rules and responsibilities of the road. The top three rider-causes of motorcycle crashes are alcohol or drug impairment, improper lane position and speeding. 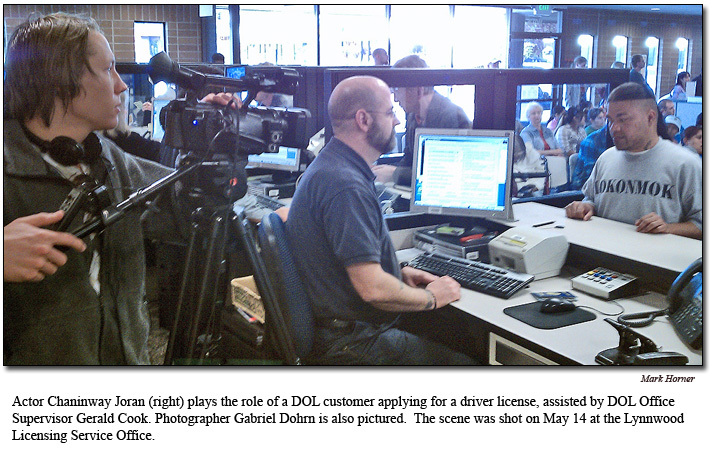 To legally operate a motorcycle on Washington roads, riders must have a driver license endorsement – or they could see their bike impounded even after a simple traffic stop. For more information about motorcycle safety training and motorcycle endorsements, go to the agency website at dol.wa.gov, or call the Washington Motorcycle Safety Program at 800-962-9010. The safety awareness campaign is funded with federal traffic safety grant funding through a partnership with the state Traffic Safety Commission. Those words this morning from one passerby as she paused to look at a mangled car and read the story on a nearby poster. 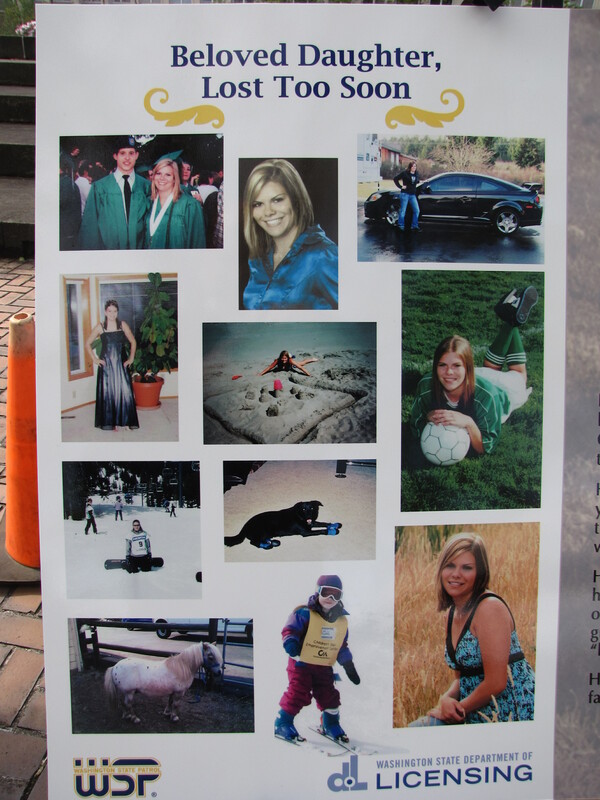 The car was driven by 19-year-old Heather Lerch earlier this year. Her parents say Heather was texting when the vehicle left the road and struck a guardrail, killing the young woman instantly. 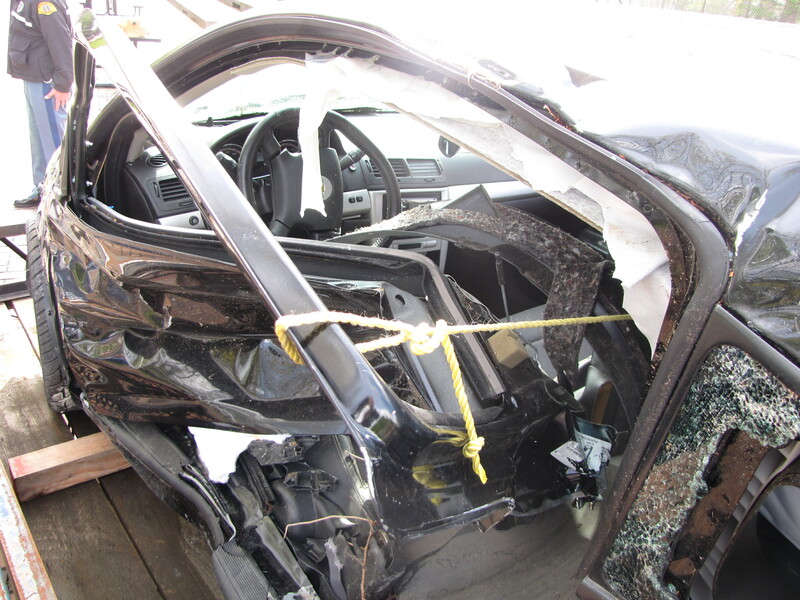 The February 23rd crash unfolded shortly before 10:30pm on Littlerock Road in Thurston County. The vehicle is one of numerous displays on the plaza of the Capitol Campus in Olympia today where Public Service Recognition Week is being recognized. 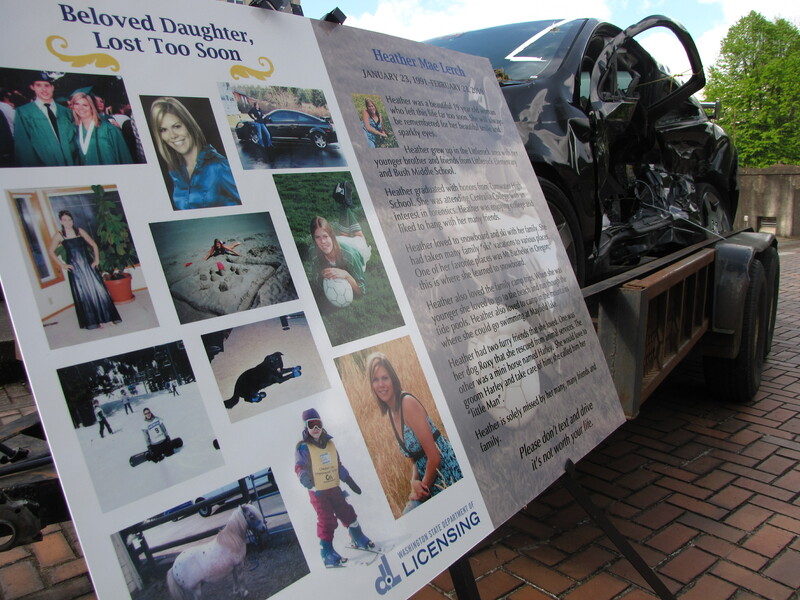 The Department of Licensing recently produced two videos about Heather’s story. A new state law concerning cell phones takes effect June 10. The law makes texting while driving a primary offense. It also makes using a hand-held cell for phone calls while driving a primary offense. 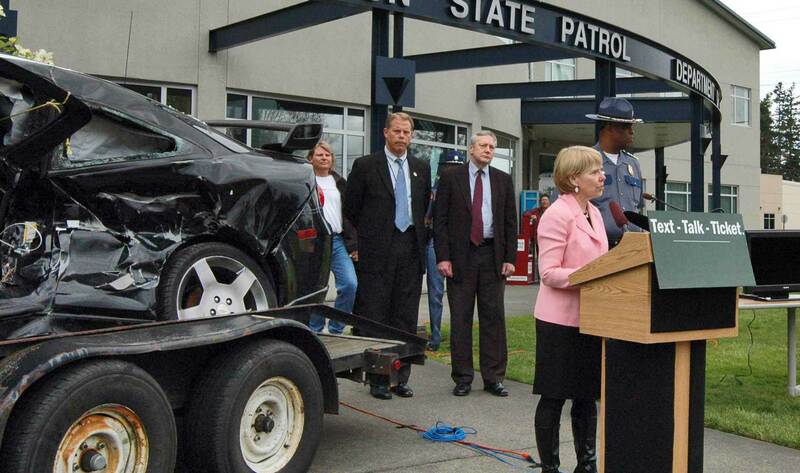 Licensing director Liz Luce speaks to reporters about using cell phones while driving on Friday, April 30 in Parkland, Wash.
Go to http://www.dol.wa.gov/driverslicense/distracteddriving.html for more information on the dangers of distracted driving. You are currently browsing the Licensing Express blog archives for May, 2010.